Interested in listening to the recording of this interview? Here it is! B: Thank you John and Pablo for doing this interview with me today I appreciate it and looking forward to the concert this Wednesday at Cornelia Street Cafe. I wanted to just talk with you guys about a few different things. Right off the bat for everyone who is reading, how long have you guys known each other and can you give us a little background as to how you guys met, your history, as friends or colleagues? P: I believe our connection was through a mutual friend. Was it through Ben? J: Yeah it was through Ben, yeah. The saxophonist Ben Dobay – I know Ben because I went to school with him in Wisconsin. And how do you know him Pablo? I can’t remember. P: I met Ben Dobay at The Banff Center a few years back when we were there together. B: At some point I knew Ben too – he might be the common ground between all of us. P: Yeah I remember Ben telling me not longer after I met him that summer that you John were moving to town. I think we met officially at The 55 Bar at someone’s gig. J: Oh yeah, I think I do remember that. P: That’s kind of a vague memory and can’t be more specific, but I think that’s how it happened. So it’s been a few years, John have I have known each for four years now. B: Now you guys both moved to town about the same time. When did you guys move to New York? P: I moved to New York early 2009. J: And I moved in later 2009. Pretty much the same time. B: John, you moved to New York to study at SUNY right? J: Yep, at SUNY Purchase. B: Pablo, what was your reason to move here other than it being an amazing city? P: That I had a lot of friends that had moved here after school. I went to school in New Orleans and after that a lot of my friends moved out here. I had been living in the midwest and decided I needed to make the move. B: This is a little offshoot since I have you both here, I like to talk to different people about this especially in our generation. Making the move here (NYC) is very different than what it used to be years and years ago. A lot of people, like John, come here to study and they create a community through that and then from there they go off into the world. And Pablo is on the other side of that. Can you guys talk to us quickly about your experiences in getting integrated into the scene here. J: I went to SUNY Purchase which is outside of New York City. But I was really intentional and kind of had my sights set on living in New York. And actually a part of the reason I chose the program at Purchase is because at that time for me it was three days a week. And I could commute up there via metronorth and so I could go up there three days a week and pretty much every night I went out and heard music and went to jam sessions and kind of did the historical thing that jazz musicians do when they move here. So that’s kind of for me how I started to get into the scene. B: Did you notice a big change once you graduated officially? Did it open up a world for you or did you feel like you had already started making a presence? J: I feel like I had already started making some progress and establishing something even if it wasn’t much because I don’t think it was at that point. But just to have a familiarity with the scene and to know some people and have some people know me and at least have a rough idea of how things work because I got out of school and already knew to some extent what I was getting into. Whereas I think some of my peers who maybe stayed on campus might not have that experience that I had. B: Now Pablo, can you tell us how your process was getting in and compare it John maybe? P: Yeah my process, I feel, might have taken a little bit longer than someone who came here for school maybe because I was trying to survive and support myself. I was working odd jobs here and there. I was working at a music store and a lot of my time was focused on just surviving initially. So it was hard initially for me to go out and make all the jam sessions and see everyones gig that I would loved to have seen and I had moved here to see. And as time got on I got a little bit more stable here which afforded me the opportunity to go out more and just you know have a presence, to use that from earlier. It’s been a real interesting learning experience. Like you said, this is New York City and learning to just live here is a school. B: It’s a school in itself. How long do you think it took for you to get over the initial hump of just surviving to get to that point? P: Oh boy. That’s a great question. At least a year. I was really bouncing around wondering, will I really live in New York? For a while I was wondering if I’d move to the west coast because I didn’t really like the lifestyle here and then overtime things got more solid, but I would say that first year was really up in the air. B: I did my masters at Manhattan School of Music and I remember Dave Liebman who was kind of running the masters program said you need to give it at least five years. You have to be on the five year plan to give New York a chance. First get integrated – even if you go to school, after school you have to give it a five year run. You guys are just over that hump now and it seems like you both are finding your place and getting things happening. We’ll come back to that to get more of your stories, but to get back to the Cornelia Street stuff. You guys first shared a bill there in January, but John was with his trio, now called Real Feels. What was the initial thing that brought you guys together for that and what was the thought process of doing it again? J: Well for me it was from known Pablo for so long, I remember when we first got it together I think it was probably because we both approached the guy who books Cornelia Street about doing a gig there and if I’m not mistaken Pablo, you can correct me, I think he suggested us doing a night together and might first thought was, Yeah, totally! I think it’s great to do shows with other people on your instrument. We all kind of learn from each other. I know for me over the years whenever I’ve heard Pablo or we’ve played together or something, I’m always trying to understand – Okay, what’s his concept? How is he thinking about the trumpet and how is he thinking about his music and how is that different from mine or how can I learn from that? For me that was definitely appealing just on that front alone. B: Pablo, what are your thoughts on that. P: I have a very vivid memory of hearing John play in a larger ensemble at The Tea Lounge before they closed their doors. This was maybe a little over a year ago. Remind me John, like a little big band maybe? And John sounded so good and thought, man I’d like to do something where we could do something together and the opportunity came up with the Cornelia Street guy. And I jumped on the chance. J: You have a different band this time than last time too, right? P: Yeah and that is something I’m moving forward with, with this new suite of music I’ve been working on. B: Right and I want to talk about in a tiny bit – so maybe we can save that for second. From a conversation we had earlier, maybe something to hit on a little deeper. So you did that in January, this time did you approach Cornelia saying: Hey, we want to do this again? or was it more like them asking, Will you guys do this again? P: Yeah, when I contacted the booker again just to stay in touch with him, I suggested that John and I had done this in January and it’d be really great if we could have another night sometime this year. And that was how we found a place for that. B: That’s great – and just to interject. You guys were just hitting on what FONT Music is trying to integrate even more into the community which is supporting collaboration in the trumpet community and the new music community. And i think what John was talking about when he was able to compare himself to other people on his own instrument he was able to look at different concepts and approaches and grow from that. And I think that’s one thing that we as FONT Music are trying to really support and put out there. Really quick, this is slight offshoot, but because we’re here – within our community, what are some things your are seeing that are positive things – or what would you like to see more of? You don’t need to go in too deep. But that is something that as we’re the younger generation coming up, do feel that’s a strong thing or should be stronger? J: Do you mean in regards to trumpet players? B: It could go both ways. It could be with trumpet or the music community you find yourself in. Maybe just some commentary on what you’re noticing. John Raymon performing with his quartet with Joe Martin (b) and Billy Hart (d) at SubCulture during his CD Release for “Foreign Territory” in April. J: I guess something that I’ve noticed personally is that I get this sense that musicians in our generation are maybe sticking together in a different kind of unique way. I don’t know if that’s similar or different than in past generations but I do know how it’s different in one sense and that is just how the industry has changed and how much, just for example, at this point most people in our generation are releasing records independently. And many of us, especially horn players, haven’t gotten many opportunities to be sidemen with other musicians who can give us our “big break”. And so I’ve felt personally that even in myself that a sense of wanting to stick together and support each other and wanting to just keep the community of musicians in our generation, at the very least, thriving. Because I think when we all look at each other we see everyone’s doing cool stuff and unique stuff. And we all know that we’re fighting hard to make it happen and there is a mutual respect for each other in that. And that’s something that I think is unique and kind of cool. B: Pablo, what are your thoughts? P: Well, I was just nodding along with everything there. That’s really great. I just want to say to piggy back on that would be, to see people doing projects together and then watch over time, I’ve only been here for five years, but to watch over time and see how the projects and when certain people come together and have a chemistry together and then you hear when they’re on the bandstand you think, Holy cow! And you always go back and think, oh these two people working together again – this is great! And just seeing that come out of this sort of mutual respect, we need to do something. That’s just what I was thinking about while you were talking. B: I think that’s really good and I think another aspect too, that you guys were talking about – John was saying our generation is a little bit different, I think social media has played a huge difference since we are able to track each other easier at all times and are able to get our music out too. We’re a generation that, when you’re able to do that it kind of changes the game. I think we can follow each other in a different way. Jumping back to Cornelia Street. You both are coming to this specific show with either different groups or different musical concepts. I was hitting that John has a new trio “Real Feels”, but you’re going to bring your quartet, right? B: Tell us about that real quick. J: Well the particular group that I’m playing with – let me back up, I guess. 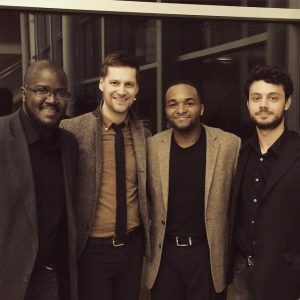 I released my last album in April which is a quartet record and right before it came out actually I had this cool opportunity to do a guest residency at a high school in Minneapolis where I’m from. And so I kind of wanted to intentionally put a band together. A little bit different from the record and would involve people who would really good at connecting with these high school students. And so I put a band together that includes Sullivan Fortner on piano, Rick Rosato on bass and Jay Sawyer on drums. All of them are incredible players but really great teachers. It was a really special couple of days on and off the bandstand. We had some really great conversations and times hanging together just the four of us and we had a great time teaching together. And we had one set of music kind of for this special concert that happened at the end of our residency. And it was one of the most gigs I’ve done in a long time and I think there was just this very special chemistry – and there is a special chemistry between all of us. So I’ve been looking for opportunities to get that band back together to do a gig or just to do something because I felt like Pablo was alluding to – when you see people and projects that evolve and see who they’re collaborating with and you start to realize when certain things have some special chemistry. You want to just go back to that again and again. That’s just for me what was my goal in trying to put a gig together, so that’ll be the band that I’m playing with on Wednesday. B: That’s exciting – that’s a really fantastic band they’re doing their own unique things as individuals players, but as you said, it’s different from the band you recorded with which is all a little bit more seasoned, been around the block a little longer – these are kind of the young lions of our time essentially, especially in the New York scene. Sullivan is with Roy Hargrove all across the world, but Rick is doing all sorts of things and Jay is too. They’re all kind of on the edge of it, which is really cool. Are you guys going to be playing the music from “Foreign Territory”? J: Exactly. 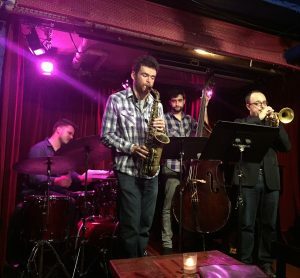 And that was kind of my goal from the beginning and it just started turning out very different with this band in kind of a unique way which is cool because I feel like I can play with these guys and I think it’s going to be a much different experience for the audience than what it would be with Billy Hart, Dan Tepfer and Joe Martin. B: Sure. Pablo, talk to us about your music that you’ll be bringing on Wednesday and your band. P: The focus on my music this time will be a suite of music that I wrote earlier this year while I was teaching in Afghanistan and I’ve been sort of tinkering with the music that I wrote during my time there. I think the band that I put together to explore this with me includes Andrew Gould on saxophone, Isaac Darche on guitar, Or Baraket on bass and Christian Coleman on drums. What can I say about that time? It’s really influenced my whole year. B: Yeah, tell us about why were you in Afghanistan? What brought you there? P: There’s a gentleman in Afghanistan that’s a trained musicologist and when the Taliban came to power he was forced out of the country. And when they were removed or whatever it was, he was able to come back and start his dream of having a music school for the kids of Afghanistan. That’s been going for five years. Every February they bring in guest teachers for the month to teach the kids more of a western musical perspective. So I went over there and sent most of February living in Kabul in a hotel, which was foreign hotel – it was an interesting time. I had a lot of down time – not much to do there. So wrote a bunch of sketches and sort of spent the time fleshing that out and I’m pretty happy with the result. This will be the first time this band has played this music publicly, so I’m a little hesitant in that sense but I’m hoping that if everything is – this is sort of what I’m planning for my next recording. B: That’s exciting! That’s enough to get folks out there a premier. Do you have a title for this suite of music? Did you say it was a suite of music? P: Tentatively I’m calling it just “Kabul Suite”. I need to think more of a name. B: Well, Foreign Territory is already taken. B: Is it influenced by the music you were hearing there or is it more of a different kind of introspective that still sounds like your other stuff? Or what can we expect out of that? P: That’s a good question. I would say it’s a mix of the music that I was hearing at the school from the kids. They teach of the traditional Afghani instruments – one I was hearing was called the Rubab (corrected from audio interview) which is like an Afghani sitar. There was also a lot of singing because there is a lot of traditional singing taught in the school there. And also during my downtime in the hotel there was a couple that was living in the room next to me that were also teaching at the school from India, and they were classical Indian musicians. So every night they’d be working on their own music for their upcoming concerts so I’d hear them practicing classical indian music for hours everyday. So that is also a sort of influence. But then you know, it’s coming from my head so my own idiosyncrasies will be there. B: Of course. That sounds really exciting. I think we could talk for hours – literally, about a lot of this stuff. But maybe the conversation can just continue after the show on Wednesday. I guess, maybe let’s do a closing statement for you guys. Anything you’d want to get off your chest at this time? If not then, then we’ll just call it, but I guess on my end thank you for being a part of this. We’re really looking forward to checking your music out. Do you want to say anything? Now’s your chance! J: Oh boy… I don’t know what to say. I probably exhausted all of my words at this point. I am looking forward to it. Last time was really fun doing this kind of a thing with Pablo. It’ll be a great night. I’m looking forward to it. B: Pablo – do you have any last words? P: This has been a fun little chat and hope that we can continue the conversation. And it’d be great just to hear in the future if you decide to do a sort of FONT curated interview again. I’d like to see this continue within the trumpet community. B: That’s what we’re trying to expand on – so thanks for being our test subjects for this essentially our first double interview and podcasts. 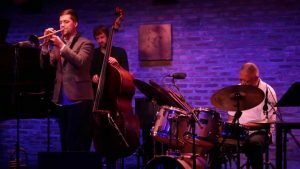 The concert will be Wednesday October 17th at 8pm with John Raymond Quartet with Sullivan Fortner, Rick Rosato and Jay Sawyer. It’s a $10 cover and $10 minimum. Does that get you into both sets, or just one? J: I believe it’s per set. P: Yes, that’s what I’ve been told. B: Awesome – and Pablo is on at 9:30 with his band. Thank you guys so much for doing and looking forward to seeing you on Wednesday. Tune in next week and we’ll do a little review of the concert. Snap some shots and take some video for those of you that couldn’t make it out. Is this being streamed online for those not living in New York City? J: I’m not sure, we’ll look into that. B: I think Cornelia Street usually does that for some of their stuff. If they do, we’ll try to get a link up for people. But if you’re in New York City you gotta be there – hear it live! Thank you guys so much and hope you have a fantastic day and thanks for bringing your music. featuring Sullivan Fortner (p), Rick Rosato (b) and Jay Sawyer (d). John’s latest album “Foreign Territory” was released in April 2015 to critical acclaim from the New York Times, Downbeat Magazine and others. Of note, his composition “Deeper” was chosen as a winner of the 2015 Herb Alpert Young Jazz Composer Award presented by ASCAP. John currently teaches at the United Nations International School, the New York Jazz Academy and various summer music workshops. In addition, he is an active guest artist and clinician at high schools and universities around the country. 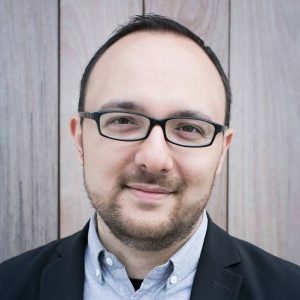 Pablo Masis – Originally from Cleveland, Ohio, Pablo spent his childhood years in northern Arizona on the Navajo Indian Reservation before moving to Billings, Montana. 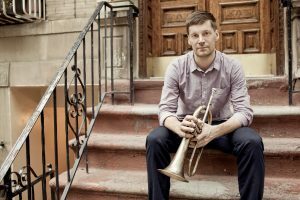 After graduating from High School, he studied classical trumpet with Robert Levy and received a Bachelor of Music degree from Lawrence University. 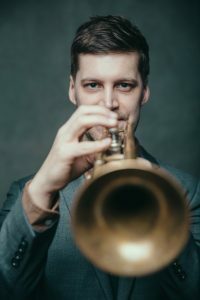 After pursuing a year of Graduate study in classical trumpet under Dennis Najoom at the University of Wisconsin-Milwaukee, he moved to New Orleans, where he studied with Terence Blanchard, Clyde Kerr Jr. and Ed Petersen, and received a Masters Degree in Jazz Studies from the University of New Orleans. He has appeared across the United States and Europe including New York, Seattle, Portland, Omaha, New Orleans, Washington DC, Belgium, The Netherlands, and Poland. He has also performed with acts such as Michael Buble, Josh Groban, Gladys Knight, and the Temptations. He attended the Betty Carter Jazz Ahead Residency at the Kennedy Center in 2007 and also participated in the Banff Centre’s Workshop in Jazz and Creative Music in 2009, led by jazz icon Dave Douglas. Since moving to New York City in early 2009 he has become an active freelancer and educator, and has performed at local venues including Joe’s Pub, The Blue Note, Arlene’s Grocery, the Bitter End, Kenny’s Castaways, The Baryshnikov Arts Center, Music Hall of Williamsburg, Irving Plaza, The Garage, and The Cornelia Street Cafe, among others. Previous PostFONT Music 2015 – THANK YOU!